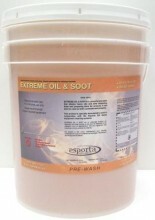 Extreme Oil and Soot is a powerful pre-spray that attacks soot, oil, and grease loosening them and preparing them for removal in the Esporta Wash System. This product is recommended for use on firefighter's turnout gear and industrial coveralls due to the citrus scent of the product that may make it less desireable for general soft contents restoration. Click here for a product use instruction guide. Use this product for removing soot, oil, grease, or tar from firefighter's turnout gear and industrial coveralls. Click to view SDS Sheet. UK Customers: Please contact for pricing and shipping times.